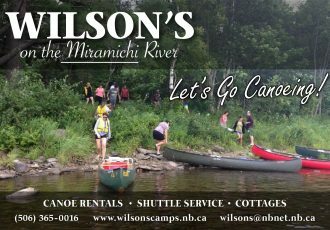 River report for Atlantic salmon fly-fishing on the Miramichi River at Wilson’s . The water is in superb condition this week . It is still dropping but very slowly and the temperature cools down nicely at night . The air was only +8 this morning . Guide Joe Stewart is pictured here with Jack Fergason’s 40 inch hen salmon taken on a green machine with white calf tail . We are still hooking mostly MSW salmon , with no complaints from most anglers but we are looking forward to the usual mid July plug of grilse and hope it is as good as 2011 . Give’m hell Joe. Obviously another good job of guiding. Nice fish. Make sure the sports know how lucky they are to be there.